Home > News Articles > The Group Company adopts a caravan for 2019! The Group Company has become the second company to get involved with the charity’s ‘Adopt a Caravan’ initiative, pledging to cover the costs of running one of the charity’s caravans for a year. The Family Holiday Association owns a number of caravans, located at holiday parks around the British coast. They play a crucial role in giving struggling families a chance to spend precious time together, especially during the peak school-holiday period. It costs approximately £10,000 annually to keep each caravan in tip-top condition, a fee that covers everything from ground rent, fuel bills, cleaning, furnishing and repairs. The Group Company has supported the charity for a number of years and were delighted to adopt a caravan based near their Head Office in York. The caravan, located at Primrose Valley in Filey, will host up to 45 families on a 3-4 night break, helping them to reconnect, strengthen bonds and sow the seeds for a brighter future. 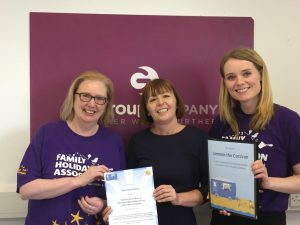 Last week, the charity team were delighted to visit The Group Company to present an official Adoption Pack filled with heart-warming family stories and seaside themed goodies. Throughout the year, they will receive monthly communications keeping the team up to date with the life of the caravan. The ‘Adopt a caravan’ initiative is part of the charity’s TOGETHER campaign, which aims to help deliver their aim of doubling the number of families they help every year by the end of 2020.